Today (Wednesday, June 1, 2016) DEP will hold a public hearing at 6 pm in Chester NJ on proposed rollbacks of what are known as the Highlands “septic density standards” (see this for the public hearing location and comment info). It is vital that all supporters of Highlands preservation, water quality, and forest protections attend and speak out at this public hearing. The proposed rules would significantly increase development in the Highlands Preservation Area, undermine the Regional Master Plan (RMP) and destroy the Highlands Council’s “capacity analysis” that forms the basis of things like the local Affordable Housing Obligations under COAH. Governor Christie has been unable to secure amendments to weaken the Highlands growth management protections through the Legislature, so he is abusing his executive powers in DEP regulations to gut the Act through the back door. The DEP proposed rollback of the Highlands “septic density standards” is an obvious political deal by the Christie DEP that lacks a scientific or legal basis. The deal is designed to settle a very old lawsuit filed way back in 2008 by the NJ Farm Bureau. But your might not be aware of all that because the Highlands Coalition has been very busy working on Dodge Foundation funded diversions and frivolous stunts like pub crawls, festivals, sports car road rallies, and golf outings, instead of defending the current DEP rules, educating the public, warning the public, and organizing opposition to this long planned rollback. Make no mistake, the fact that the DEP was even able to propose this rule shows that there has been a massive failure of advocacy at the Highlands Coalition and their Foundation funders. They knew it was coming for 6 YEARS and did nothing to organize public opposition to block it. I blame them as much as the Christie DEP, who were just following orders. I provide this information, which documents the political deal that reversed the prior Corzine DEP and an independent Administrative Law Judge’s legal and scientific findings. But you really don’t need to take my word for it. The OAL hearing was held on January 13 through 16, 2009. In an Initial Decision dated March 24, 2009, the Administrative Law Judge (ALJ) concluded that the rule at N.J.A.C. 7:38-3.4 establishing the septic system density standards was based upon substantial credible evidence in the record and was a valid exercise of the agency’s discretion. In his Final Decision dated July 13, 2009, the Commissioner of the Department adopted and supplemented the Initial Decision, finding there was substantial, credible evidence in the record to conclude the Department had a rational, scientific basis for establishing the septic system density standards, and that the Farm Bureau did not meet its burden of proving the Department’s methodology was arbitrary or capricious. The Farm Bureau and the Department filed additional briefs with the Appellate Division and oral argument was scheduled forMarch 9, 2010. At the request of the Department, and with the consent of the Farm Bureau, the Court entered an order dated March 5, 2010, removing the appeal from its calendar and staying it until September 9, 2010. With the consent of the Farm Bureau, the Department requested, and the Appellate Division granted, additional stays of the appeal until December 28, 2011. Before the expiration of the stay, the Department moved for a remand so that it could develop and propose appropriate amendments to the septic system density standards. The Court granted the motion and dismissed the appeal without prejudice on January 25, 2012. The public comment period on the DEP’s proposed draft “dewatering” permit for the Transco compressor station in Chesterfield closes today. The compressor station would serve the proposed NJ Natural Gas “Southern Reliability Link” Pinelands pipeline. That pipeline is part of the regional interstate PennEast pipeline project. The draft permit, DEP staff report, public hearing transcript, and public comment information can be found here (upper right “What’s New”). I understand that the Pinelands Preservation Alliance has challenged the stream encroachment permit issued for the project. More importantly, the freshwater wetlands permits and the Clean Water Act Section 401 “water quality certificate” for the project have not been issued by DEP. Applications for those DEP approvals were submitted last July and August. Here are my comments on the dewatering permit – I was simply laying a foundation to challenge the final permit if and when it is issued by DEP. 1. The applicant has not demonstrated that the project is in the public interest. There is no demonstration at all. The applicant has not met his regulatory burden under applicable laws and DEP rules. 2. The basis for the Department’s determination that the project is in the public interest is not based on stated facts that are in the administrative record or based on promulgated regulatory criteria. The Department’s determination is arbitrary and capricious and an abuse of discretion. 3. The applicant has failed to show – and the Department has failed to consider and conclude – whether the project would comply with groundwater quality standards and surface water quality standards, including hydro-modifcation of streams and wetlands and associated ecological and aquatic life impacts on existing uses of the ground and surface waters. 4. It is premature to issue this permit before the State freshwater wetlands permit is issued. 5. It is premature to issue this permit before the State and federal Clean Water Act “Water Quality Certificate” is issued. 6. The Department is improperly segmenting the permitting and environmental review of a massive regional gas infrastructure project. The full scope of the project involves impacts from fracking wells that supply the gas, the pipeline and compressor station infrastructure, and the end uses of the gas. Such segmentation frustrates the public’s ability to adequately review and comment on this draft permit. 7. The Department has failed to consider the cumulative and lifecycle impacts of the compressor station and the complete gas infrastructure project that the compressor station serves. Such a narrow “silo” scope of permit review frustrates the public’s ability to adequately review and comment on this draft permit. 8. Improper segmentation and scope of review constitute inappropriate review practices that violate sound science, competent regulatory practice, and the public interest. *9. I heard nothing from the applicant during their presentation at the public hearing or in the permit application (the initial version or the amended version) or the DEP’s draft permit and staff report that provided facts and standards upon which to establish the “just and equitable” requirement with respect to other users. A “just and equitable” analysis would have to be based upon and explicitly consider the public ownership of the State’s water resources and the DEP’s Trustee obligations established under the Water Supply Management Act to protect that resource for the people of the State, not an out of State corporation. Risks, impacts, benefits and costs and their distribution would need to be considered explicitly and heavily weighted in favor of the people of the state and the public interest. This demonstration has the same technical flaws noted about impacts on residential wells and similar legal flaws as the “public interest” demonstration. For these reasons, the draft permit should be denied by DEP and not issued as a final permit until all of the above flaws and deficiencies are remedied. These permit review practices violate Department’s Public Trust Obligations under the NJ Water Supply Management Act pursuant to which the draft permit is authorized. But it’s going to take a LOT more than LTE’s. Even more than this great work. The current strategy of the PennEast pipeline folks I have criticized is fatally flawed and consumed by a focus on FERC, private property rights, and inside technical arguments (see the most recent diversion, inside baseball, and technical misfire: wrong agency and wrong water issue). It appears to assume that delay and “regulatory uncertainty” will either drive up the costs or force the corporations to abandon the project – or that delay will buy sufficient time for the next NJ Governor to use State DEP powers to kill the project. These folks seem to think that it is premature to deploy a CWA 401 WQC strategy because wetlands permits have not been filed with DEP. They seem to assume that they can simply flip a switch and refocus the activists and public debate when those draft permits are issued by the NJ DEP. As I’ve written numerous times, that is magical thinking and a losing strategy. 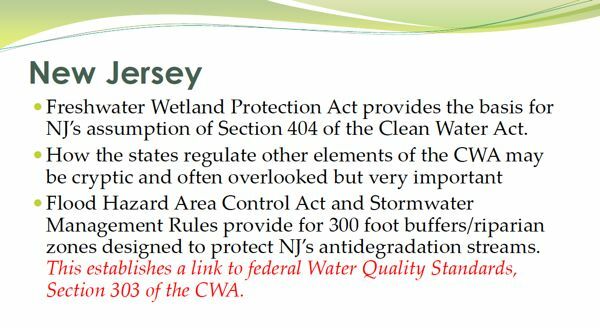 The Trenton oriented environmental groups and their grassroots community partners should start a statewide campaign focused exclusively on the Clean Water Act Section 401 Water Quality Certificate issue and the NJ DEP/Governor. Such a campaign NOW would seize the initiative, correctly frame the issue, and supplant the diversions from the “RETHINK Energy NJ” PennEast campaign. 5) provide the technical basis and grassroots support for public participation in DEP wetlands permits (the DEP’s 401 WQ certificate mechanisms) when they are issued. As I’ve written, this would involve a technical component and a citizens organizing component. b) water quality studies that demonstrated compliance with the numeric and narrative criteria and existing use policies of the State Water Quality Standards, again based on 4 quarters of comprehensive representative data. The Regulatory component would be based on the DEP’s SWQS and freshwater wetlands permit regulations, the EPA Section 401 Manual and EPA SWQS regulation and Guidance, and the case law from successful prior State 401 denials. The citizen organizing component would include “A Citizens Guide to Using The Clean Water Act to Block Pipelines” (an EPA Section 401 WQC Manual and EPA federal SWQS Guidance Document are already written and could be easily revised to fit NJ’s regulatory scheme). The Citizens activists piece would also include fact sheets, LTE’s, media framing and talking points, events, and political targets. This is what all the deep pocketed Foundation funded groups should have been spending their money and activist focus on from day one. Such a strategy would have collateral benefits by forcing the hand of the RETHINK Energy NJ and Dodge and Wm. Penn Foundation funded weenies and other moderates or NIMBY’s who merely seek to re-route the pipeline from their own backyards or harvest mitigation deals, and keep them from selling out. AMY GOODMAN: Would you call for a moratorium on fracking? BILL McKIBBEN: Well, I don’t—I mean, I don’t know what the language will be or even quite what that would mean, but I think at this point the key is at least to keep it from growing any faster than it can. What? Don’t know what a fracking moratorium would mean? WTF! Stand with Vermont and other states to ban fracking for natural gas. Fracking threatens our air and water. Disposal of wastewater from fracking causes earthquakes. Oklahoma became the number one place for earthquakes on Earth this year because gas companies inject fracking fluid back into the ground. Fracking is a large-scale industrial process that doesn’t belong in anyone’s backyard or deserve exemption from laws that protect the health of our children. That’s why communities all over the country from New York to California and Texas to Colorado have stood up to the oil and gas industry and said they don’t want fracking in their backyards. Bernie was very proud when Vermont became the first state to ban fracking. We have clean energy solutions to climate change, and fracking is not one of them. If he hesitates in an interview on Democracy Now!, the Democratic platform Committee, stacked with corporate Democrats and Hillary supporters, will eat him alive. How much longer will the environmental community & media neglect this issue? I want to focus on just one of Martin’s responses to a series of questions from Assemblyman Singleton about interstate pipelines and DEP’s environmental review process, particularly with respect to DEP powers versus FERC powers specifically including reconciling conflicts between FERC need determination and DEP’s environmental review. We can not fight that .. If we did reject a pipeline it would end up in court very quickly. That is factually false, as NY State DEC and Connecticut demonstrated in rejecting FERC regulated pipelines. Martin also lied by omission by failing to note DEP’s powers under the Clean Water Act. But Martin could not have gotten away with those falsehoods without a little help from his friends. Friends in the environmental community that have failed to conduct a public campaign to educate the public and pressure DEP to deny Clean Water Act Section 401 Water Quality Certificates for FERC regulated pipelines, like NY State DEC and Connecticut did to kill pipelines. The Rethink Energy NJ/PennEast campaign has been misdirected. Had there been a high profile campaign, Martin could never have gotten away with those lies. Friends in the media who have totally failed to cover this issue in NJ or the recent NY DEC denial. Had there been press coverage and accountability, no way Martin gets away with those lies. Friends in the Legislature who have known about but failed to challenge the Christie administration on this specific DEP Clean Water Act authority, which is NOT preempted by FERC or the Natural Gas Act. How much longer will the environmental community and the media neglect this issue?